What does a pile of crap look like? Climbing out of the Big 12 cellar will be a major improvement for the 2013 Kansas Jayhawks. Heck, just winning one conference game would be a major step for a program that has proven it doesn’t give a damn about football and went 2-10 last year. 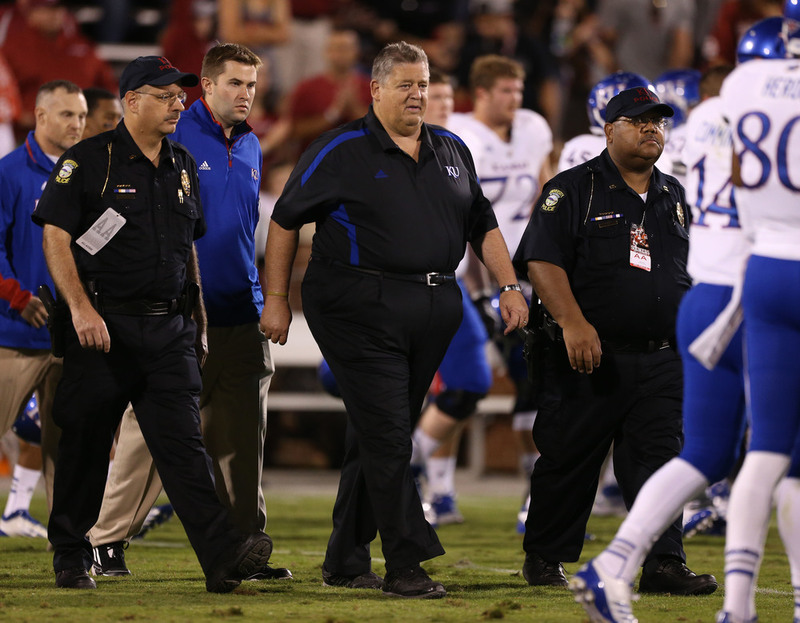 Head coach Charlie Weis will rely on transfers to help that long climb out of the conference basement. KU had a couple of close games last year, but the offense (93rd in total offense and 115th in scoring last year) just didn’t have enough firepower to put the Jayhawks in the win column. Jake Heaps (6-1, 210, Jr.), a transfer from BYU, sat out 2012, but he should be ready to take the reins at quarterback this year. He was the No. 1 quarterback in 2009 from the state of Washington. After a good freshman season for the Cougars, he struggled his sophomore year, lost his starting job and transferred to Lawrence. The offense returns only 4.5 starters. The one-half is sophomore quarterback Michael Cummings (5-10, 201), who started five games in the last half of 2012 replacing Dayne Crist. Cummings didn’t fare much better than Crist, as he completed only 47.7 percent of his passes for 456 yards with 3 TDs and 4 INTs. If Heaps is as good as expected, Cummings will be riding the pine all season. James Sims (6-0, 200, Sr.) was the only bright star on a struggling offense. He rushed for 1,013 yards last year and scored nine times. He made the second-team all-conference team as a junior. He will be hard-pressed to repeat those numbers again in 2013, especially with three starters gone on the offensive line. Sims’ backup Tony Pierson (5-10, 170, Jr.) added 760 yards and 4 TDs. Pierson was the team’s second-leading receiver a year ago, snaring 21 balls for 291 yards and a couple of scores. The receiving corps will need to improve. Kale Pick, the leading receiver last year, has graduated. Two junior college transfers should help the group. Rodriguez Coleman was one of the top JUCO receivers out of Garden City Community College last year, pulling in 70 passes for 1,055 yards. Mark Thomas from Nassau (N.Y.) Community College recorded 26 catches for 285 yards and 7 TDs. Of course, the defense also needs to help. JUCO transfers might come to the rescue of a D that ranked 113th last year. Junior linebacker Ben Heeney (6-0, 227) led the Hawks with 112 tackles a year ago, including 12 behind the line of scrimmage. This got him second-team all-conference honors in 2012. Jake Love (6-0, 220, Soph.) started in four games and played in all 12 games last year. He recorded 36 stops, including eight for losses. Three seniors are expected to return to anchor the front line again in ’13. Tackles Keba Agostinho (6-2, 280) and Jordan Tavai (6-3, 290) combined for 36 tackles a year ago. End Kevin Young (6-3, 285) had 19 tackles, three for losses. Four JUCO transfers may push for starting nods up front. Junior Marquel Combs (6-3,300) is the most notable with a top ranking by ESPN.com and a four-star rating by Rivals.com. Another JUCO star, Chris Martin, was expected to start up front, but he was booted from the squad following a recent arrest. The secondary is going to need some major help with the graduation of three starters and the defection of the fourth, cornerback Tyler Patmon, who transferred to Oklahoma State. Whoever the KU coaches throw into the mix have to be an improvement, though. Last year the secondary gave up 289 yards per game through the air, but did pick off 11 passes. Ron Doherty (5-11, 209, Sr.) returns to lead the special teams with all of the kicking chores—kickoffs, PATs, field goals and punting. Punting is Doherty’s stronger suit, as he averaged 40.5 yards per boot in ’12. He hit only half of his 10 field goal attempts, with a long of 37 yards, and he missed only one of 12 tries on PATs. Long snapper Reilly Jeffers (6-2, 230, Soph.) and holder Blake Jablonski (6-1, 205, Jr.) will be back, but the Jayhawks will be looking for new return men this year. This is going to be another tough year for KU football, and once again, Jayhawk fans will be counting the days for basketball season to start about mid-October.